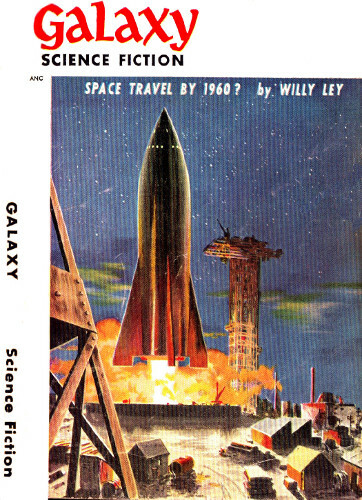 Galaxy Science Fiction September 1952.
you can needle the world into the darndest mess! "All right," I said, "what is sociology good for?" Wilton Caswell, Ph.D., was head of my Sociology Department, and right then he was mad enough to chew nails. On the office wall behind him were three or four framed documents in Latin that were supposed to be signs of great learning, but I didn't care at that moment if he papered the walls with his degrees. I had been appointed dean and president to see to it that the university made money. I had a job to do, and I meant to do it. He bit off each word with great restraint: "Sociology is the study of social institutions, Mr. Halloway." I tried to make him understand my position. "Look, it's the big-money men who are supposed to be contributing to the support of this college. To them, sociology sounds like socialism—nothing can sound worse than that—and an institution is where they put Aunt Maggy when she began collecting Wheaties in a stamp album. We can't appeal to them that way. Come on now." I smiled condescendingly, knowing it would irritate him. "What are you doing that's worth anything?" "This department's analysis of institutional accretion, by the use of open system mathematics, has been recognized as an outstanding and valuable contribution to—"
The words were impressive, whatever they meant, but this still didn't sound like anything that would pull in money. I interrupted, "Valuable in what way?" He sat down on the edge of his desk thoughtfully, apparently recovering from the shock of being asked to produce something solid for his position, and ran his eyes over the titles of the books that lined his office walls. "Well, sociology has been valuable to business in initiating worker efficiency and group motivation studies, which they now use in management decisions. And, of course, since the depression, Washington has been using sociological studies of employment, labor and standards of living as a basis for its general policies of—"
I stopped him with both raised hands. "Please, Professor Caswell! That would hardly be a recommendation. Washington, the New Deal and the present Administration are somewhat touchy subjects to the men I have to deal with. They consider its value debatable, if you know what I mean. If they got the idea that sociology professors are giving advice and guidance—No, we have to stick to brass tacks and leave Washington out of this. What, specifically, has the work of this specific department done that would make it as worthy to receive money as—say, a heart disease research fund?" He began to tap the corner of his book absently on the desk, watching me. "Fundamental research doesn't show immediate effects, Mr. Halloway, but its value is recognized." I smiled and took out my pipe. "All right, tell me about it. Maybe I'll recognize its value." Prof. Caswell smiled back tightly. He knew his department was at stake. The other departments were popular with donors and pulled in gift money by scholarships and fellowships, and supported their professors and graduate students by research contracts with the government and industry. Caswell had to show a way to make his own department popular—or else. I couldn't fire him directly, of course, but there are ways of doing it indirectly. He laid down his book and ran a hand over his ruffled hair. "Institutions—organizations, that is—" his voice became more resonant; like most professors, when he had to explain something he instinctively slipped into his platform lecture mannerisms, and began to deliver an essay—"have certain tendencies built into the way they happen to have been organized, which cause them to expand or contract without reference to the needs they were founded to serve." He was becoming flushed with the pleasure of explaining his subject. "All through the ages, it has been a matter of wonder and dismay to men that a simple organization—such as a church to worship in, or a delegation of weapons to a warrior class merely for defense against an outside enemy—will either grow insensately and extend its control until it is a tyranny over their whole lives, or, like other organizations set up to serve a vital need, will tend to repeatedly dwindle and vanish, and have to be painfully rebuilt. "The reason can be traced to little quirks in the way they were organized, a matter of positive and negative power feedbacks. Such simple questions as, 'Is there a way a holder of authority in this organization can use the power available to him to increase his power?' provide the key. But it still could not be handled until the complex questions of interacting motives and long-range accumulations of minor effects could somehow be simplified and formulated. In working on the problem, I found that the mathematics of open system, as introduced to biology by Ludwig von Bertalanffy and George Kreezer, could be used as a base that would enable me to develop a specifically social mathematics, expressing the human factors of intermeshing authority and motives in simple formulas. "By these formulations, it is possible to determine automatically the amount of growth and period of life of any organization. The UN, to choose an unfortunate example, is a shrinker type organization. Its monetary support is not in the hands of those who personally benefit by its governmental activities, but, instead, in the hands of those who would personally lose by any extension and encroachment of its authority on their own. Yet by the use of formula analysis—"
"That's theory," I said. "How about proof?" "My equations are already being used in the study of limited-size Federal corporations. Washington—"
I held up my palm again. "Please, not that nasty word again. I mean, where else has it been put into operation? Just a simple demonstration, something to show that it works, that's all." He looked away from me thoughtfully, picked up the book and began to tap it on the desk again. It had some unreadable title and his name on it in gold letters. I got the distinct impression again that he was repressing an urge to hit me with it. He spoke quietly. "All right, I'll give you a demonstration. Are you willing to wait six months?" "Certainly, if you can show me something at the end of that time." Reminded of time, I glanced at my watch and stood up. "Could we discuss this over lunch?" he asked. "I wouldn't mind hearing more, but I'm having lunch with some executors of a millionaire's will. They have to be convinced that by, 'furtherance of research into human ills,' he meant that the money should go to research fellowships for postgraduate biologists at the university, rather than to a medical foundation." "I see you have your problems, too," Caswell said, conceding me nothing. He extended his hand with a chilly smile. "Well, good afternoon, Mr. Halloway. I'm glad we had this talk." I shook hands and left him standing there, sure of his place in the progress of science and the respect of his colleagues, yet seething inside because I, the president and dean, had boorishly demanded that he produce something tangible. I frankly didn't give a hoot if he blew his lid. My job isn't easy. For a crumb of favorable publicity and respect in the newspapers and an annual ceremony in a silly costume, I spend the rest of the year going hat in hand, asking politely for money at everyone's door, like a well-dressed panhandler, and trying to manage the university on the dribble I get. As far as I was concerned, a department had to support itself or be cut down to what student tuition pays for, which is a handful of over-crowded courses taught by an assistant lecturer. Caswell had to make it work or get out. But the more I thought about it, the more I wanted to hear what he was going to do for a demonstration. At lunch, three days later, while we were waiting for our order, he opened a small notebook. "Ever hear of feedback effects?" "Not enough to have it clear." "You know the snowball effect, though." "Sure, start a snowball rolling downhill and it grows." "Well, now—" He wrote a short line of symbols on a blank page and turned the notebook around for me to inspect it. "Here's the formula for the snowball process. It's the basic general growth formula—covers everything." It was a row of little symbols arranged like an algebra equation. One was a concentric spiral going up, like a cross-section of a snowball rolling in snow. That was a growth sign. I hadn't expected to understand the equation, but it was almost as clear as a sentence. I was impressed and slightly intimidated by it. He had already explained enough so that I knew that, if he was right, here was the growth of the Catholic Church and the Roman Empire, the conquests of Alexander and the spread of the smoking habit and the change and rigidity of the unwritten law of styles. "Is it really as simple as that?" I asked. "You notice," he said, "that when it becomes too heavy for the cohesion strength of snow, it breaks apart. Now in human terms—"
The chops and mashed potatoes and peas arrived. He was deep in the symbology of human motives and the equations of human behavior in groups. After running through a few different types of grower and shrinker type organizations, we came back to the snowball, and decided to run the test by making something grow. "You add the motives," he said, "and the equation will translate them into organization." "How about a good selfish reason for the ins to drag others into the group—some sort of bounty on new members, a cut of their membership fee?" I suggested uncertainly, feeling slightly foolish. "And maybe a reason why the members would lose if any of them resigned, and some indirect way they could use to force each other to stay in." "The first is the chain letter principle," he nodded. "I've got that. The other...." He put the symbols through some mathematical manipulation so that a special grouping appeared in the middle of the equation. "That's it." Since I seemed to have the right idea, I suggested some more, and he added some, and juggled them around in different patterns. We threw out a few that would have made the organization too complicated, and finally worked out an idyllically simple and deadly little organization setup where joining had all the temptation of buying a sweepstakes ticket, going in deeper was as easy as hanging around a race track, and getting out was like trying to pull free from a Malayan thumb trap. We put our heads closer together and talked lower, picking the best place for the demonstration. "How about Watashaw? I have some student sociological surveys of it already. We can pick a suitable group from that." "This demonstration has got to be convincing. We'd better pick a little group that no one in his right mind would expect to grow." "There should be a suitable club—"
Picture Professor Caswell, head of the Department of Sociology, and with him the President of the University, leaning across the table toward each other, sipping coffee and talking in conspiratorial tones over something they were writing in a notebook. "Ladies," said the skinny female chairman of the Watashaw Sewing Circle. "Today we have guests." She signaled for us to rise, and we stood up, bowing to polite applause and smiles. "Professor Caswell, and Professor Smith." (My alias.) "They are making a survey of the methods and duties of the clubs of Watashaw." We sat down to another ripple of applause and slightly wider smiles, and then the meeting of the Watashaw Sewing Circle began. In five minutes I began to feel sleepy. There were only about thirty people there, and it was a small room, not the halls of Congress, but they discussed their business of collecting and repairing second hand clothing for charity with the same endless boring parliamentary formality. I pointed out to Caswell the member I thought would be the natural leader, a tall, well-built woman in a green suit, with conscious gestures and a resonant, penetrating voice, and then went into a half doze while Caswell stayed awake beside me and wrote in his notebook. After a while the resonant voice roused me to attention for a moment. It was the tall woman holding the floor over some collective dereliction of the club. She was being scathing. I nudged Caswell and murmured, "Did you fix it so that a shover has a better chance of getting into office than a non-shover?" "I think there's a way they could find for it," Caswell whispered back, and went to work on his equation again. "Yes, several ways to bias the elections." "Good. Point them out tactfully to the one you select. Not as if she'd use such methods, but just as an example of the reason why only she can be trusted with initiating the change. Just mention all the personal advantages an unscrupulous person could have." He nodded, keeping a straight and sober face as if we were exchanging admiring remarks about the techniques of clothes repairing, instead of conspiring. After the meeting, Caswell drew the tall woman in the green suit aside and spoke to her confidentially, showing her the diagram of organization we had drawn up. I saw the responsive glitter in the woman's eyes and knew she was hooked. We left the diagram of organization and our typed copy of the new bylaws with her and went off soberly, as befitted two social science experimenters. We didn't start laughing until our car passed the town limits and began the climb for University Heights. If Caswell's equations meant anything at all, we had given that sewing circle more growth drives than the Roman Empire. Four months later I had time out from a very busy schedule to wonder how the test was coming along. Passing Caswell's office, I put my head in. He looked up from a student research paper he was correcting. "Caswell, about that sewing club business—I'm beginning to feel the suspense. Could I get an advance report on how it's coming?" "I'm not following it. We're supposed to let it run the full six months." "But I'm curious. Could I get in touch with that woman—what's her name?" "Would that change the results?" "Not in the slightest. If you want to graph the membership rise, it should be going up in a log curve, probably doubling every so often." I grinned. "If it's not rising, you're fired." He grinned back. "If it's not rising, you won't have to fire me—I'll burn my books and shoot myself." I returned to my office and put in a call to Watashaw. I picked up a red gummed star and licked it. "She's not in just now. Could I take a message?" I placed the star at the thirty line in the beginning of the first section. Thirty members they'd started with. "No, thanks. Could you tell me when she'll be back?" "Not until dinner. She's at the meetin'." "The sewing club?" I asked. "No, sir, not that thing. There isn't any Sewing club any more, not for a long time. She's at the Civic Welfare meeting." Somehow I hadn't expected anything like that. Poor Caswell. The bet between us was ironclad. He wouldn't let me back down on it even if I wanted to. He'd probably quit before I put through the first slow move to fire him. His professional pride would be shattered, sunk without a trace. I remembered what he said about shooting himself. It had seemed funny to both of us at the time, but.... What a mess that would make for the university. I had to talk to Mrs. Searles. Perhaps there was some outside reason why the club had disbanded. Perhaps it had not just died. I called back. "This is Professor Smith," I said, giving the alias I had used before. "I called a few minutes ago. When did you say Mrs. Searles will return?" "About six-thirty or seven o'clock." And what if Caswell asked me what I had found out in the meantime? I didn't want to tell him anything until I had talked it over with that woman Searles first. "Where is this Civic Welfare meeting?" Five minutes later, I was in my car, heading for Watashaw, driving considerably faster than my usual speed and keeping a careful watch for highway patrol cars as the speedometer climbed. The town meeting hall and theater was a big place, probably with lots of small rooms for different clubs. I went in through the center door and found myself in the huge central hall where some sort of rally was being held. A political-type rally—you know, cheers and chants, with bunting already down on the floor, people holding banners, and plenty of enthusiasm and excitement in the air. Someone was making a speech up on the platform. Most of the people there were women. I wondered how the Civic Welfare League could dare hold its meeting at the same time as a political rally that could pull its members away. The group with Mrs. Searles was probably holding a shrunken and almost memberless meeting somewhere in an upper room. There probably was a side door that would lead upstairs. While I glanced around, a pretty girl usher put a printed bulletin in my hand, whispering, "Here's one of the new copies." As I attempted to hand it back, she retreated. "Oh, you can keep it. It's the new one. Everyone's supposed to have it. We've just printed up six thousand copies to make sure there'll be enough to last." The tall woman on the platform had been making a driving, forceful speech about some plans for rebuilding Watashaw's slum section. It began to penetrate my mind dimly as I glanced down at the bulletin in my hands. "Civic Welfare League of Watashaw. The United Organization of Church and Secular Charities." That's what it said. Below began the rules of membership. I looked up. The speaker, with a clear, determined voice and conscious, forceful gestures, had entered the homestretch of her speech, an appeal to the civic pride of all citizens of Watashaw. "With a bright and glorious future—potentially without poor and without uncared-for ill—potentially with no ugliness, no vistas which are not beautiful—the best people in the best planned town in the country—the jewel of the United States." She paused and then leaned forward intensely, striking her clenched hand on the speaker's stand with each word for emphasis. "All we need is more members. Now get out there and recruit!" I finally recognized Mrs. Searles, as an answering sudden blast of sound half deafened me. The crowd was chanting at the top of its lungs: "Recruit! Recruit!" Mrs. Searles stood still at the speaker's table and behind her, seated in a row of chairs, was a group that was probably the board of directors. It was mostly women, and the women began to look vaguely familiar, as if they could be members of the sewing circle. I put my lips close to the ear of the pretty usher while I turned over the stiff printed bulletin on a hunch. "How long has the League been organized?" On the back of the bulletin was a constitution. She was cheering with the crowd, her eyes sparkling. "I don't know," she answered between cheers. "I only joined two days ago. Isn't it wonderful?" I went into the quiet outer air and got into my car with my skin prickling. Even as I drove away, I could hear them. They were singing some kind of organization song with the tune of "Marching through Georgia." Even at the single glance I had given it, the constitution looked exactly like the one we had given the Watashaw Sewing Circle. All I told Caswell when I got back was that the sewing circle had changed its name and the membership seemed to be rising. Next day, after calling Mrs. Searles, I placed some red stars on my graph for the first three months. They made a nice curve, rising more steeply as it reached the fourth month. They had picked up their first increase in membership simply by amalgamating with all the other types of charity organizations in Watashaw, changing the club name with each fusion, but keeping the same constitution—the constitution with the bright promise of advantages as long as there were always new members being brought in. By the fifth month, the League had added a mutual baby-sitting service and had induced the local school board to add a nursery school to the town service, so as to free more women for League activity. But charity must have been completely organized by then, and expansion had to be in other directions. Some real estate agents evidently had been drawn into the whirlpool early, along with their ideas. The slum improvement plans began to blossom and take on a tinge of real estate planning later in the month. The first day of the sixth month, a big two page spread appeared in the local paper of a mass meeting which had approved a full-fledged scheme for slum clearance of Watashaw's shack-town section, plus plans for rehousing, civic building, and rezoning. And good prospects for attracting some new industries to the town, industries which had already been contacted and seemed interested by the privileges offered. And with all this, an arrangement for securing and distributing to the club members alone most of the profit that would come to the town in the form of a rise in the price of building sites and a boom in the building industry. The profit distributing arrangement was the same one that had been built into the organization plan for the distribution of the small profits of membership fees and honorary promotions. It was becoming an openly profitable business. Membership was rising more rapidly now. By the second week of the sixth month, news appeared in the local paper that the club had filed an application to incorporate itself as the Watashaw Mutual Trade and Civic Development Corporation, and all the local real estate promoters had finished joining en masse. The Mutual Trade part sounded to me as if the Chamber of Commerce was on the point of being pulled in with them, ideas, ambitions and all. I laughed, filing the newspaper with the other documents on the Watashaw test. These proofs would fascinate any businessman with the sense to see where his bread was buttered. A businessman is constantly dealing with organizations, including his own, and finding them either inert, cantankerous, or both. Caswell's formula could be a handle to grasp them with. Gratitude alone would bring money into the university in carload lots. The end of the sixth month came. The test was over and the end reports were spectacular. Caswell's formulas were proven to the hilt. After reading the last newspaper reports, I called him up. "Perfect, Wilt, perfect! I can use this Watashaw thing to get you so many fellowships and scholarships and grants for your department that you'll think it's snowing money!" He answered somewhat disinterestedly, "I've been busy working with students on their research papers and marking tests—not following the Watashaw business at all, I'm afraid. You say the demonstration went well and you're satisfied?" He was definitely putting on a chill. We were friends now, but obviously he was still peeved whenever he was reminded that I had doubted that his theory could work. And he was using its success to rub my nose in the realization that I had been wrong. A man with a string of degrees after his name is just as human as anyone else. I had needled him pretty hard that first time. "I'm satisfied," I acknowledged. "I was wrong. The formulas work beautifully. Come over and see my file of documents on it if you want a boost for your ego. Now let's see the formula for stopping it." He sounded cheerful again. "I didn't complicate that organization with negatives. I wanted it to grow. It falls apart naturally when it stops growing for more than two months. It's like the great stock boom before an economic crash. Everyone in it is prosperous as long as the prices just keep going up and new buyers come into the market, but they all knew what would happen if it stopped growing. You remember, we built in as one of the incentives that the members know they are going to lose if membership stops growing. Why, if I tried to stop it now, they'd cut my throat." I remembered the drive and frenzy of the crowd in the one early meeting I had seen. They probably would. "No," he continued. "We'll just let it play out to the end of its tether and die of old age." "It can't grow past the female population of the town. There are only so many women in Watashaw, and some of them don't like sewing." "You underestimate their ingenuity," I said into the phone. "Since they wanted to expand, they didn't stick to sewing. They went from general charity to social welfare schemes to something that's pretty close to an incorporated government. The name is now the Watashaw Mutual Trade and Civic Development Corporation, and they're filing an application to change it to Civic Property Pool and Social Dividend, membership contractual, open to all. That social dividend sounds like a Technocrat climbed on the band wagon, eh?" While I spoke, I carefully added another red star to the curve above the thousand member level, checking with the newspaper that still lay open on my desk. The curve was definitely some sort of log curve now, growing more rapidly with each increase. "Leaving out practical limitations for a moment, where does the formula say it will stop?" I asked. "When you run out of people to join it. But after all, there are only so many people in Watashaw. It's a pretty small town." "They've opened a branch office in New York," I said carefully into the phone, a few weeks later. With my pencil, very carefully, I extended the membership curve from where it was then. After the next doubling, the curve went almost straight up and off the page. Allowing for a lag of contagion from one nation to another, depending on how much their citizens intermingled, I'd give the rest of the world about twelve years. There was a long silence while Caswell probably drew the same graph in his own mind. Then he laughed weakly. "Well, you asked me for a demonstration." That was as good an answer as any. We got together and had lunch in a bar, if you can call it lunch. The movement we started will expand by hook or by crook, by seduction or by bribery or by propaganda or by conquest, but it will expand. And maybe a total world government will be a fine thing—until it hits the end of its rope in twelve years or so. What happens then, I don't know. But I don't want anyone to pin that on me. From now on, if anyone asks me, I've never heard of Watashaw.